Let's say your venue will hold a max of 100 people. 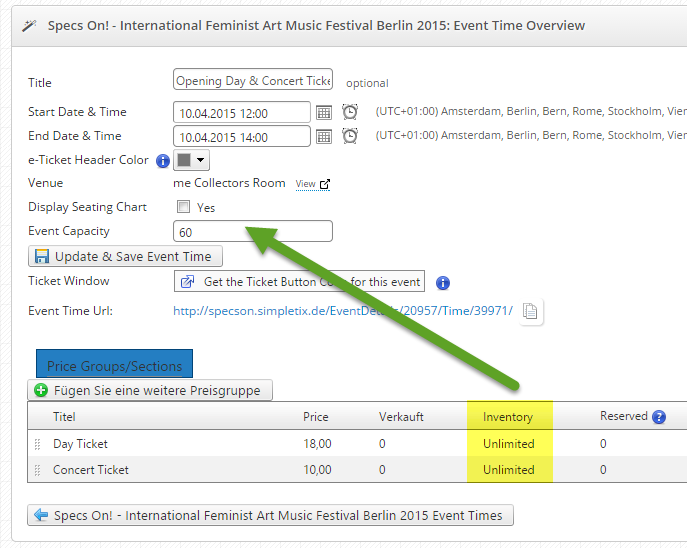 Normally you would simply set your event time's "Event Capacity" to 100 and then create your price groups. However let's say you want to set a hard limit for 40 tickets for one price tier and let 2 other price tiers share the remaining inventory. We want to sell exactly: 40 "Festival Passes". The "Day Ticket" and "Concert Tickets" basically share the remaining availability pool of 60 tickets. 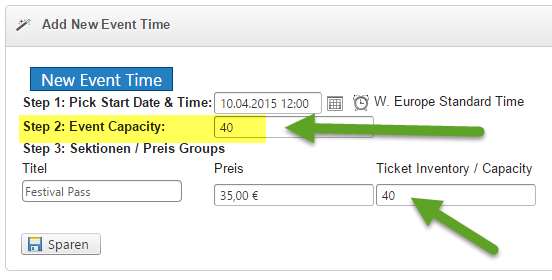 To achieve this you will need to create 2 event times in order to split the inventory correctly. Now we will create another event time for just the: Day Ticket and Concert Tickets to share the remaining availability pool of 60 tickets. We set the Event Capacity to 60, and we can leave the 2 price tiers at Unlimited - as the will adhere to the 60 set at the time level.